Improved legume species and varieties have the most impact on a pasture’s ability to support high milk production. Are you getting the most out of your pasture in terms of high-quality forage production and milk yield? If not, why? Researchers at the University of Wisconsin-Madison set out to answer these questions for pastures in the Upper Midwest, where dairy farms that utilize pastures are widespread with over 25 percent of the nation’s organic dairies residing in this region. Pasture use is a requirement for those that are certified organic; in fact, at least 30 percent of the cow’s dry matter intake must come from pasture during the growing season. 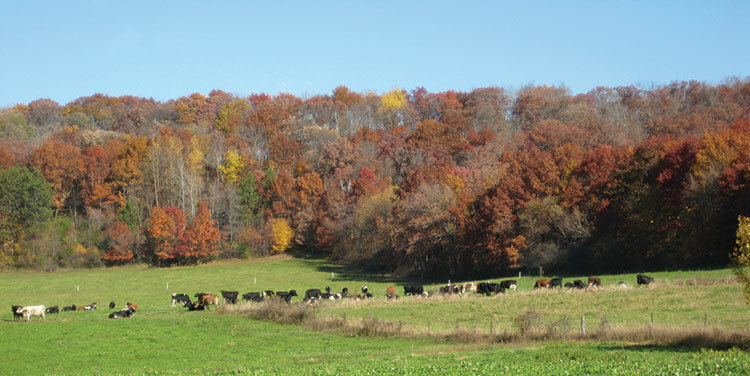 While the use of intensive rotational grazing has improved livestock production and pasture utilization, limited research has been done on active dairy farms to quantify and understand interrelated factors involving the plant species present, soil fertility, and pasture management. With the continued higher demand for pasture-based dairy products, systems that improve milk production will be needed. Researchers in Wisconsin looked at how milk production from pastures can be improved by working directly with 20 producers in on-farm trials. While it was of interest what factors were important for maximizing milk production, the main goal was to use this analysis to help producers prioritize activities that would result in getting the most milk from their pastures. Researchers calculated potential production through the use of a predictive model that estimates milk yield. The model takes into account forage quantity and quality, while eliminating inconsistencies between farms like animal genetics and supplemental feed quality or amount. The results are reported in pounds of 3.5 percent fat corrected milk per acre, showing the economic impact of different practices. Keeping an adequate residual height contributes to plant persistence, faster spring regrowth, and ultimately improved milk production. Twenty organic dairies across Wisconsin and Iowa were visited during 2013 and 2014; two paddocks were studied on each farm, totaling 40 paddocks. Paddocks were visited in June and September within three days of the next grazing event. This allowed researchers to get the most accurate representation of the quality, quantity, and species composition of what the animals would be eating. As species differed dramatically from farm to farm, they were grouped into planted (improved) and not planted (unimproved) grasses, legumes, and weeds. Common improved species found were orchardgrass, tall fescue, and red clover; common unimproved species were Kentucky bluegrass, quackgrass, and Dutch white clover. Paddocks were soil sampled in October and analyzed for both macronutrients and micronutrients. A soil respiration indicator kit was also used to estimate soil microbial activity. Pasture slope, soil yield potential, and drainage class, gathered from NRCS’s web soil survey, were also documented. Farm practices were collected by asking producers about their typical pasture practices over the past five years. This allowed for integration of what has happened over time; past practices often impact current pasture composition and performance. Documented practices were pasture inputs and renovation strategies; pasture management (for example, rest periods and forage turn-in height); and livestock management decisions such as stocking rate and how much time animals spent in each paddock. Researchers used a statistical method to find which of 32 plant, soil, and management factors were explaining differences in the calculated potential milk production. Common factors were found that explained a large portion of the differences in potential milk production per acre. Below we highlight the important ones with respect to plant species present, grazing practices, and soil characteristics. More than 40 percent improved legume cover and less than 70 percent cover from unimproved grass were both associated with higher milk production in June and September. Improved legume cover exceeding 40 percent in June boosted milk production by 97 percent, an additional 1,000 pounds of milk per acre for one June grazing event. 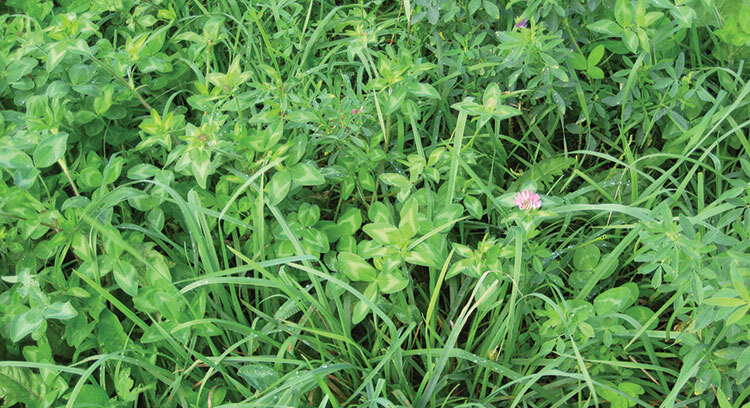 The legume’s ability to fix atmospheric nitrogen allows for higher overall pasture yield, which proved especially important. They also provide vital protein content and a more even annual forage distribution compared to grass-only pastures. While unimproved legumes also enhanced milk production, improved varieties were much more important. This is likely due to active breeding of varieties to fix more atmospheric nitrogen and have better yield and persistence compared to unimproved legumes like the native Dutch white clover. Having less than 70 percent unimproved grass cover in June and September boosted milk production by more than 75 percent. Common unimproved grasses found on farms included Kentucky bluegrass and quackgrass. These species produce less yield and have lower forage quality compared to improved varieties. High-fiber levels associated with low forage quality can slow rumen passage, lowering intake and, therefore, production. Unimproved grasses also have the potential to reduce the establishment and development of legumes, which was identified as the most important factor in milk production. Fortunately, our results suggest that unimproved grasses do not have to be completely eradicated but must be managed such that they don’t dominate a sward. Surprisingly, weed cover did not influence potential milk production in June or September. This is most likely due to the high forage quality of the most common weeds found: dandelion, broadleaf plantain, and foxtails. Our results suggest that management of weeds in pastures is species dependent and that some weed species may not be impacting milk production. Residual sward height, the amount of forage left after a grazing event, was a grazing management factor that was associated with more milk production in both June and September. In June, maintaining a residual sward height of at least 3.25 inches throughout the year almost doubled potential milk production, from 780 pounds per acre to 1,420 pounds per acre. Adequate residual height is necessary for improved grass and legume species persistence and can allow for more annual grazing events. In September, maintaining a residual sward height of 3.75 inches at the end of the grazing season was important, raising milk production by over 400 pounds per acre. Residual sward height at the end of the season is particularly important for winter survival and spring regrowth of improved grasses and legumes. Supplemental feeding or expanding the number of paddocks on your farm to allow for longer rest periods can help maintain higher residual heights. Pasture slope was the only soil factor found as important for potential milk production in June and September; unfortunately, it’s a factor that cannot easily be changed. Although no soil fertility factors were important in explaining potential milk production, factors such as soil pH are essential for the survival of legumes and, therefore, demand consideration. In fact, very few pasture soils were low in macronutrients, while low levels of micronutrients were more common. Although soil fertility was not identified as an important variable, it may be a significant factor on individual pastures. As this research was designed to assess regional issues, this may have impacted our ability to detect differences. Based on our findings, it is clear that pasture management and species composition are higher priorities for improvement at a regional scale, but we suggest growers assess pasture soil fertility and correct deficiencies as needed. In summary, sufficient pasture legume composition (over 40 percent), limited dominance of unimproved grasses (under 70 percent), and leaving adequate residual forage after a grazing event (over 3 inches) seemed to be extremely important for optimizing milk production. While there may be reasons for suboptimal livestock performance in individual pastures, these three factors were shown to be regionally important and commonly not optimized. Although this research was done on certified organic pastures, we believe these results are also applicable for any pasture-based system. This article appeared in the April/May 2017 issue of Hay & Forage Grower on pages 22 and 23.